Nightcrawler arrives in France at Professor Xavier's request, and receives a Cerebro booster from Forge, who leaves before the X-Men arrive. Elsewhere, the Acolytes, who have captured Moira MacTaggert, probe her memory for details about the process with which she briefly brainwashed Magneto and the X-Men. 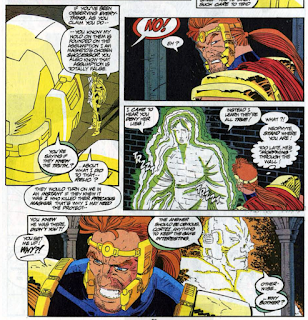 As the X-Men rendezvous with Nightcrawler, Moira tells one of the Acolytes, the young Neophyte, how Cortez actually killed Magneto, a truth later confirmed when Neophyte overhears Cortez talking with Gamesmaster, prompting him to flee the Acolytes castle. 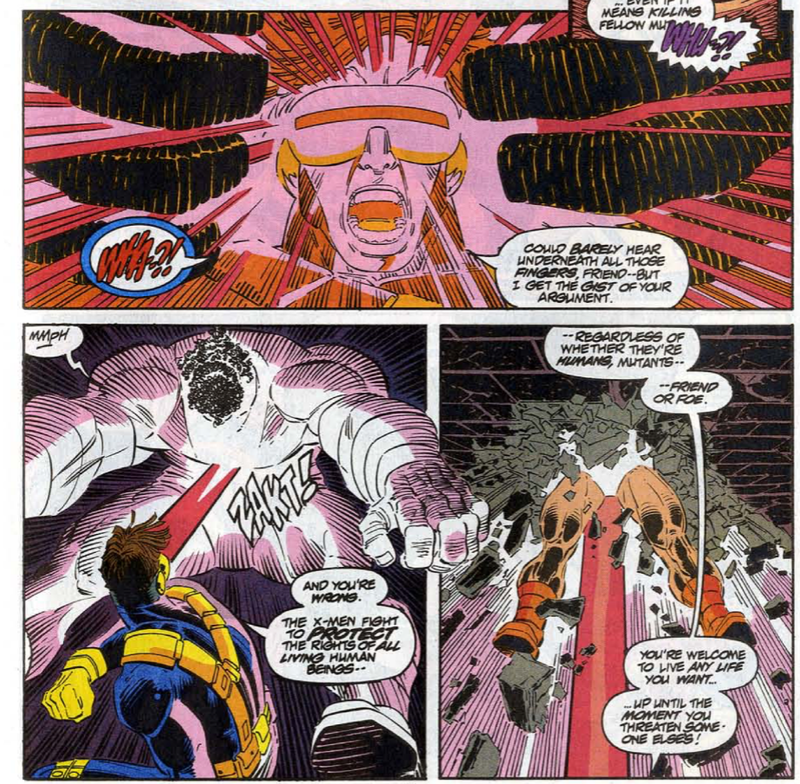 Using Forge's device, the X-Men locate the Acolytes, just as Neophyte is found by a young human girl who is slain by Cortez' guard, sent to retrieve Neophyte. The X-Men defeat the guard and Neophyte agrees to help them infiltrate the castle. They arrive just as Cortez is about to kill Moira, and a battle ensues. Cortez attempts to abandon the Acolytes and escape, but he is delayed by Neophyte long enough for Wolverine to gut him. Xavier offers Neophyte a place with him, but Neophyte declines, saying he must find his own way in the world, but that Xavier and Magneto's dreams are more similar than either realizes. 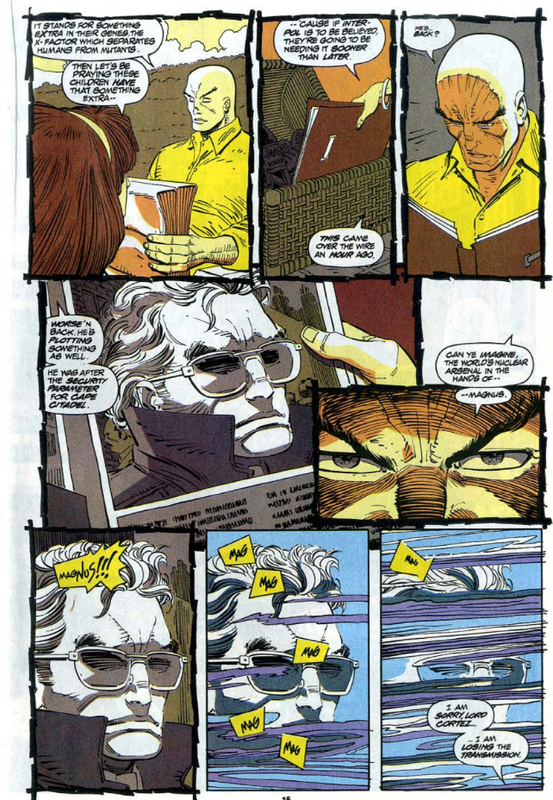 Cortez is retrieved from the hospital where he was recovering from Wolverine's attack by one of the Acolytes, after which he learns from Gamesmaster that the points he was awarded for killing Magneto have been taken away, which Cortez realizes can only mean one thing. 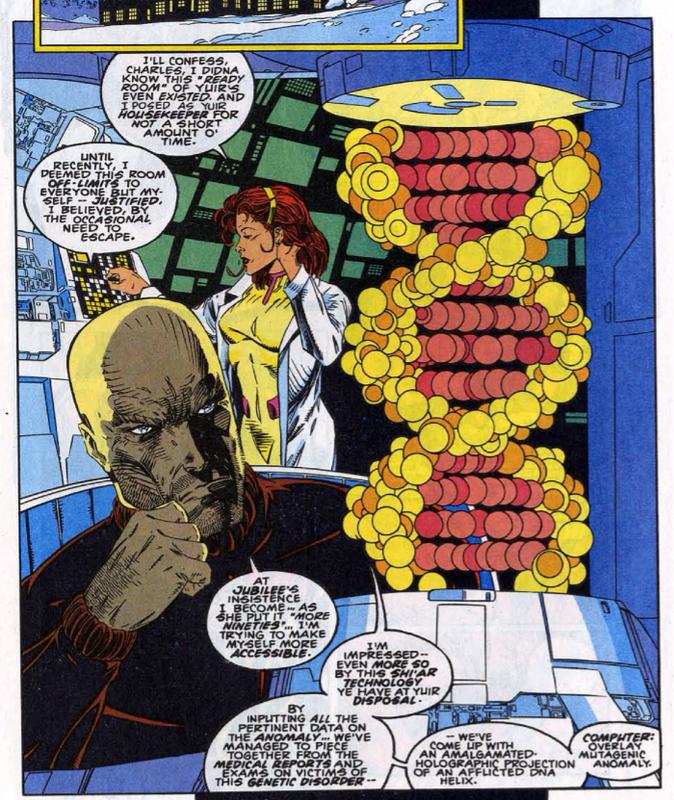 Meanwhile, at the X-Mansion, Xavier & Moira discuss the recent virus which seems to be targeting mutants. 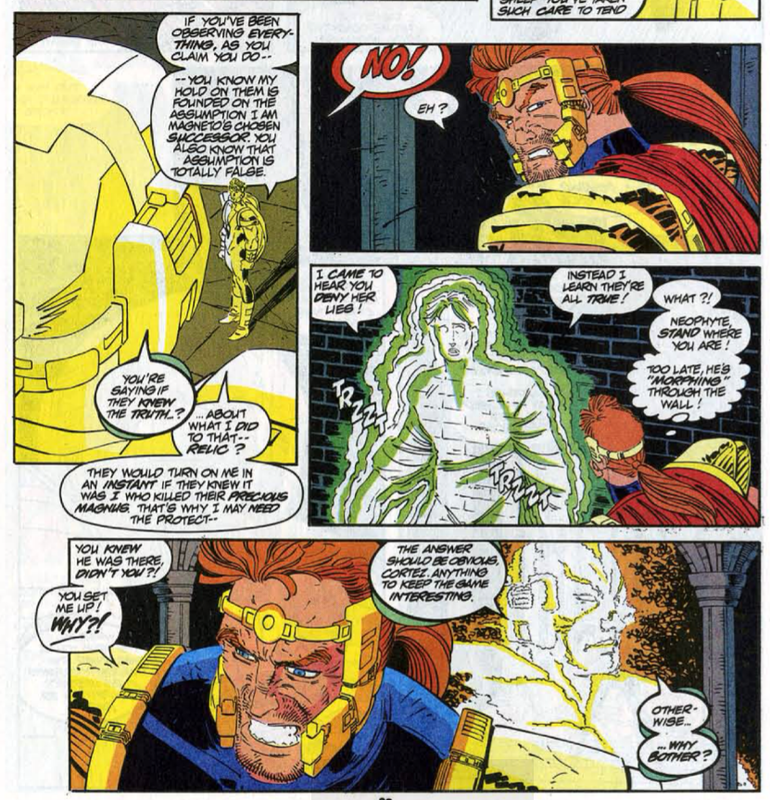 Moira's words spark a recollection in Xavier of Stryfe's files, and he asks her what treatment there is. She replies there is none; in all cases she's studied, once contracted, the virus is terminal. Though his "official" return is held for issue #304 (and the intervening months will be filled with additional teases to that effect), this issue more or less confirms that Magneto is still alive when, in the issue's second story, the Gamesmaster strips Cortez of all the points he was given for killing Magneto, which Cortez realizes can only mean one thing (but he doesn't go so far as to say it: that Magneto is alive). In addition to teasing the return of Magneto, the epilogue also continues to tease Illyana's fate and the larger Legacy Virus storyline, with Illyana's excerpt from Stryfe's Strike File reprinted as Xavier begins to realize that Illyana is suffering from no mere bout of the flu. After filling in on issue #287 and drawing the Cable limited series, John Romita Jr. returns to the series as the book's new regular artist (along with his longtime inker Dan Green), bringing along his new (relative to his first run) blocker style. This second run will be significantly shorter than his first, cut short by the ascent of Joe Madureira and feature two fill-ins (along with one jam issue). This is also Brandon Petersen's last issue on the series, as he draws the epilogue following the main story. This issue introduces a slew of new Acolytes, most of whom will stick around as stalwart members of this iteration of the group: Milan (who has an arrow on his forehead for some reason and possesses the dubious ability to transform thoughts into electro-magnetic images ie he can put your memories on TV), Javitz (a big guy with an eye-patch made out of a headband), the oddly named Seamus Mellencamp (who is a big lizard person), Scanner (who can detect other mutants), Neophyte (who has a phasing power not unlike Shadowcat's and clearly isn't meant to be named Neophyte - it's implied to be his rank here, something later writers will miss and continue to call him Neophyte), and Amelia Voght, another teleporter who is the arguable standout of this group, as she will turn out to have a pre-X-Men past with Xavier and star in one of Lobdell's best issues. 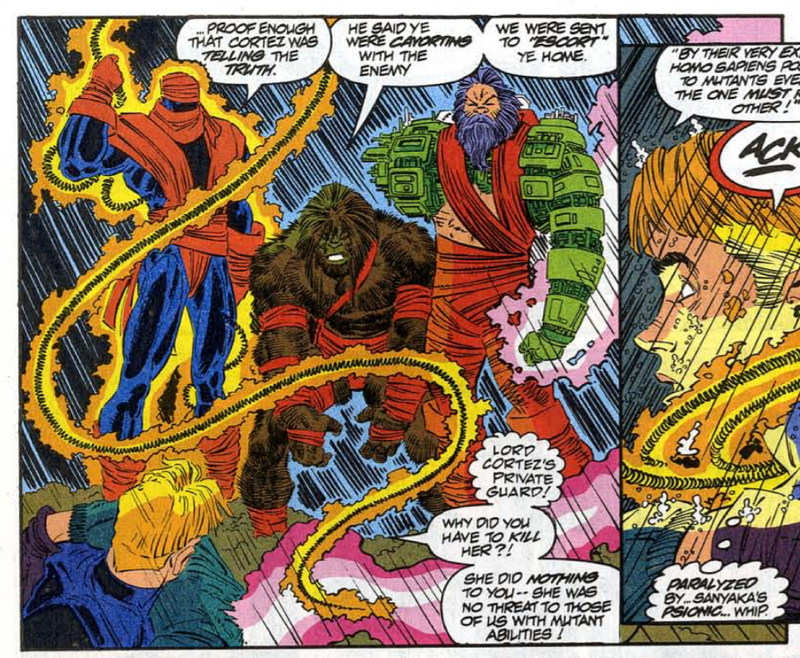 Additionally, we see the members of Cortez's personal guard, all of whom wear individual attire rather than the now-standard Acolyte uniform: Senyaka (who has a psionic whip and will get his own action figure because the 90s) is arguably the standout of this group, but Katu (the one-armed guy) will feature in some Cable issues while Spoor (the Beast Man guy) will end up doing some stuff in Excalibur. Iceman debuts his new spiky look in this issue, the next step in the "Iceman isn't using his powers to their full potential" plotline. Motivated by Mikhail's taunting him as such in issue #291-293, his new appearance is also motivated by Romita wanting to punch up his look. Nightcrawler guest stars in this issue, helping the X-Men as a favor to Xavier, but really, so that the core "All New, All Different" team can reunite for issue #300. He describes himself as the leader of the Excalibur, which while true, is putting it a bit more bluntly than that series ever has. 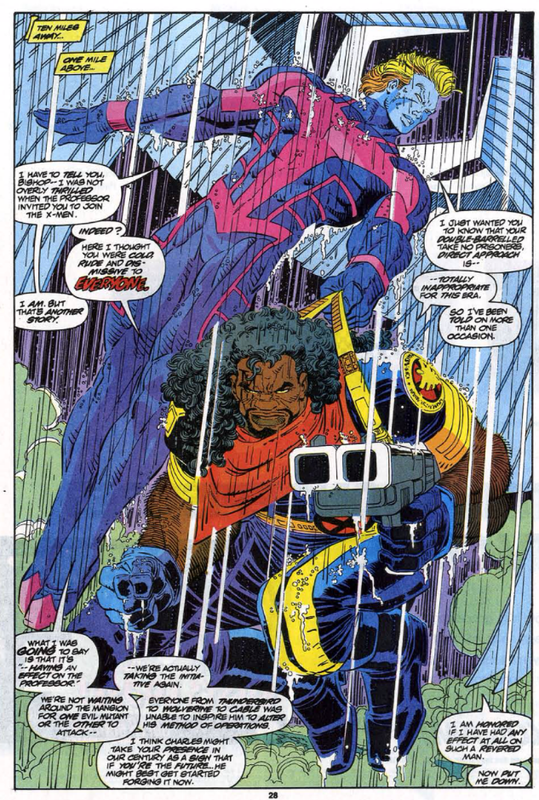 His presence leads to Storm and Nightcrawler interacting directly, on panel, for the first time since issue #211. 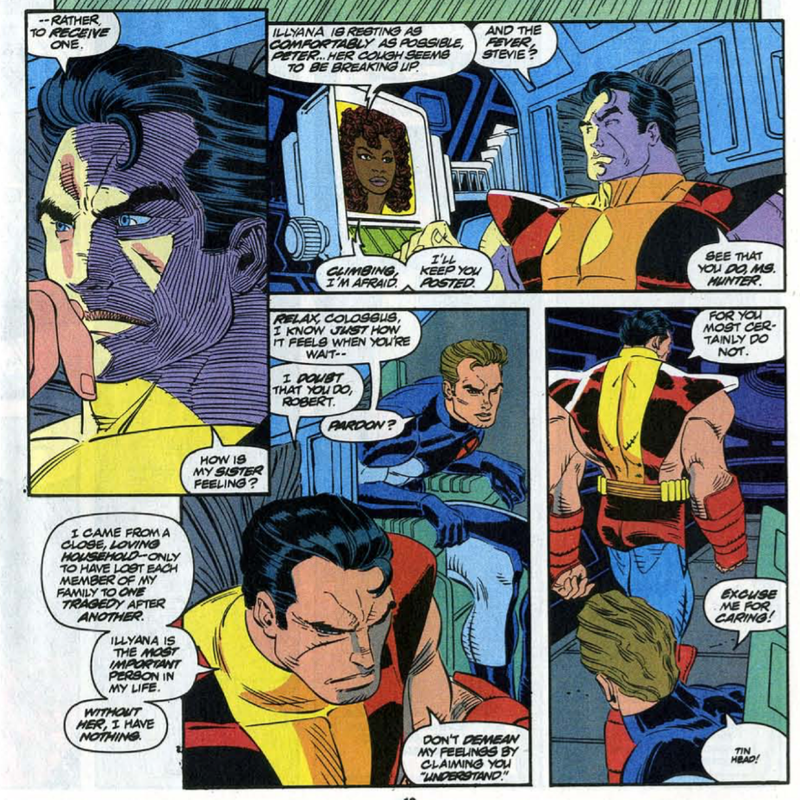 Forge also returns, appearing in person to hand off a Cerebro booster to Nightcrawler before leaving in order to avoid any awkwardness with Storm. This begins a string of Forge appearances in the series over the next few months, before he transfers over to X-Factor. 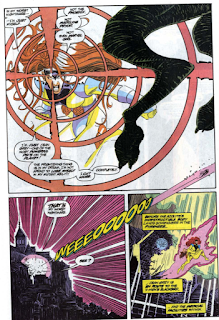 There's a pair of flashback pages in this issue, set just before X-Men #1, showing Xavier and Moira discussing Xavier's proposed first class of X-Men and Magneto's imminent attack on Cape Citadel. We also see that Xavier was aware of the "All New" X-Men prior to the creation of the team, but chose to go with the original five as they were younger and thus less set in their ways. He also reiterates the notion that the "X" in X-Men doesn't stand for "Xavier". It's also revealed that Xavier has some kind of past with Acolyte Amelia Voght; their past together will be explored in issue #309, though it doesn't quite fit with what's teased here (this seems to suggest she is a failed student; we'll eventually learn she and Xavier were lovers and she objected to the concept of the X-Men as an unnecessary escalation). This issue features a "Prismatic Foil-Enhanced" cardstock cover with holographic "X" logos on the background, the first time the series has featured what we traditionally think of as a gimmick cover. 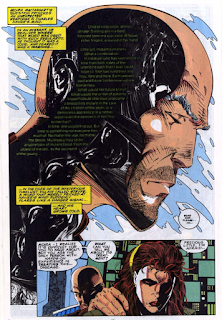 In the "things that could have been" department, it's worth noting that issue #300 is about as far into the future as any of Claremont's various "if I hadn't left the series" plans went, as he intended the issue to be a more direct sequel of sorts to issue #200 as well as the true culmination of his Shadow King storyline, with Xavier dying to defeat the Shadow King and Magneto replacing him with the X-Men once and for all. Nightcrawler appears here between issues #60 and #61 of Excalibur, prior to the concurrent RCX storyline (which explains why he's still wearing his old/original costume and not the Warpie-created one). Moira appears here after X-Factor #90, with her appearance here setup in that issue (and her experiences in Genosha informing her conversation with Xavier in the epilogue). 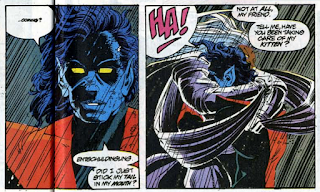 Nightcrawler talks about going into battle with Forge like it's something they did often; aside from fighting the Direwraiths shortly after Forge's first appearance (when he wasn't yet a member of the team), was there any other time the pair would have fought together (or really, even interacted at all)? In the wake of breaking up with Storm and leaving the X-Men, Forge has grown bitter about the X-Men in general. 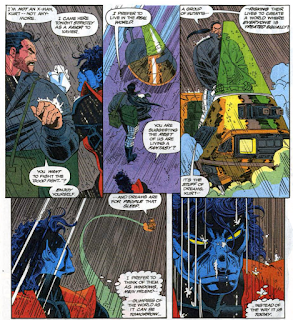 Nightcrawler suggests that being a mutant might be synonymous with change, a sentiment that gets brought up a lot during Lobdell's run. 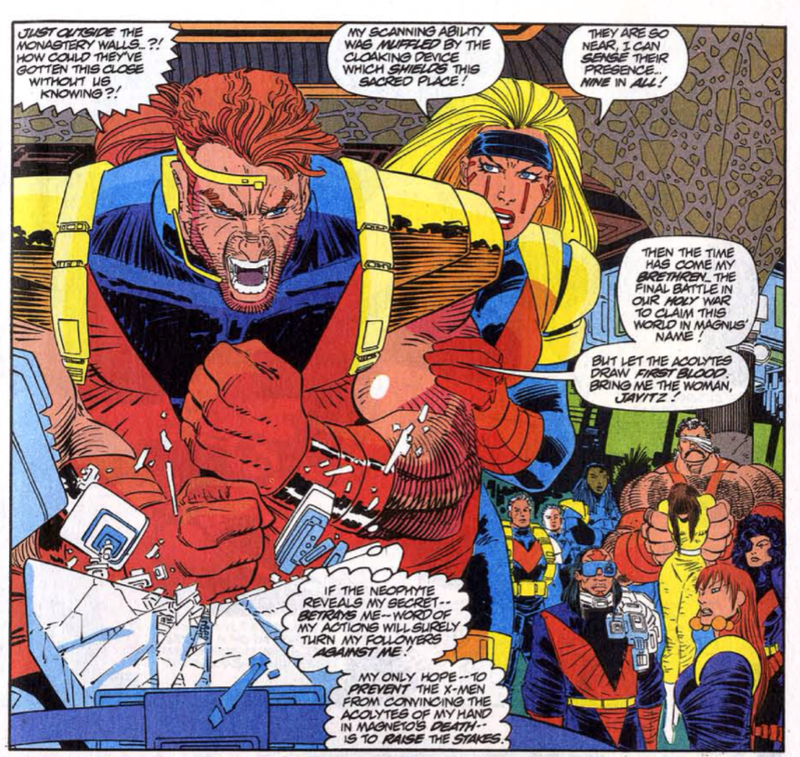 The X-Men's last trip to France, in issue #200, is referenced by an angry mob. 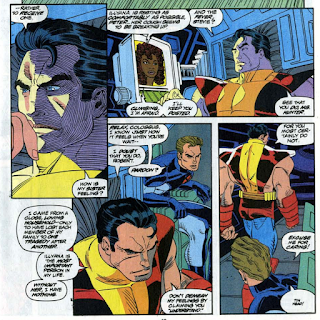 En route to the Acolytes base, Colossus calls Stevie Hunter to check in on Illyana, who continues to run a fever. Colossus is also noticeably short-tempered with Iceman. 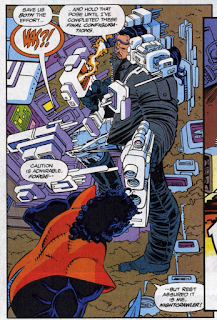 Neophyte learns this issue that Cortez actually killed Magneto, and it's also suggested that Voght knows this too. He learns this thanks to Gamesmaster, who tricks Cortez into admitting it and being overheard in order to keep the Upstarts' game interesting. Archangel points out to Bishop the impact Bishop's presence has had on Xavier. 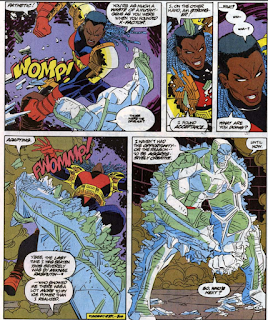 With both in the field together, Storm and Cyclops briefly argue over leadership responsibilities, with Storm failing to defer to Cyclop's clear superiority as a leader. In a declaration/explanation of her lack of a codename, Jean name drops Madelyne Pryor, which is always nice to see (great depiction of Jean's power, too). Bishop notes that in his future, no one has ever heard of Cortez (which actually kinds of fits, since he mostly disappears from the franchise after "Bloodties"). Seemingly left for dead at the end of the main story, the epilogue shows that Voght retrieved Cortez from an Italian hospital where he was recovering from Wolverine's attack after being turned over to authorities. In a rant/monologue, Cortez says that he was born royalty. It turns out that Xavier's Ready Room, first seen in issue #298, is a surprise to Moira as well, despite her brief stint as Xavier's housekeeper (and points for name-checking Moira's housekeeper days). Forge is wielding some top-notch JRjr guns in the opening pages. Seriously, I love that stuff; it just screams "comic book!" to me in the same way Kirby Tech and the Kirby Crackle does. 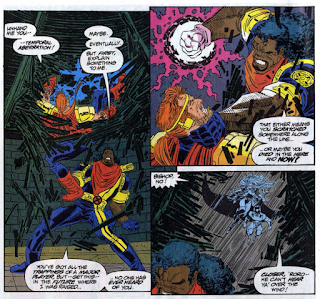 Xavier responds to the mobs' request that the X-Men leave by using his telepathy to make them think the X-Men have left. 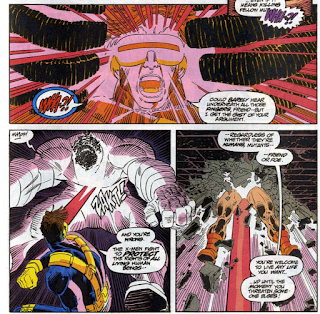 Cyclops tells one of the Acolytes he's the X-Men fight to protect everyone, friend or foe, and that anyone is welcome to whatever life they want, up to the point they start threatening someone else's. Reading this issue when I was younger, having already been fully trained by Wizard magazine and the speculator market of the early 90s to expect every issue with a number divisible by twenty-five, especially a double-sized one with a fancy cover celebrating an anniversary, to be a BIG DEAL, I was consistently underwhelmed by it in terms of how big a deal it was. It doesn't serve as a culmination to a long-running storyline and/or significant character developments (as Claremont initially intended for his planned #300 issue); in fact, though it builds on events from the previous two issues, it's mostly standalone (as they were as well). And while it more or less comes right up to the line of saying "Magneto is alive! ", it doesn't actually cross that line, saving the full reveal of his resurrection for issue #304 (which always seemed to overshadow this issue in terms of significance and anniversary-ness), which made what should have been a BIG DEAL issue read instead like an appetizer for the main course of issue #304. But reading it now, this actually does serve as a rather fitting celebration of the history of the X-Men as they reach a milestone issue of some significance, albeit in more subtle ways than just featuring the return of their historically chief antagonist or making it so things "will never be the same again!". Whether a happy coincidence of timing or the result of a planned effort, having John Romita Jr.'s second artistic stint begin with issue #300 is a nice touch, giving this issue some added symmetry with issue #200, the last centenary issue of the series, which JRjr also drew. That issue was also centered on the question of Magneto's fate (albeit more directly, with Magneto actually appearing in the issue and shaking up the status quo by replacing Xavier) and found the X-Men in France, parallels Lobdell makes explicit here. As a kid, the inclusion of Nightcrawler was just a fun guest appearance by a former member of the team; now, I recognize the importance, in terms of celebrating the X-Men's history, of reuniting the core of the "All New, All Different" team for the first time since "Mutant Massacre". The two flashbacks, via Moira's memories and Milan's oddly-specific power, hearken back to the series' earliest days. And while this issue doesn't feature a status quo change on par with Magneto taking over the school or the events to come shortly in "Fatal Attractions", there is a subtle sense of "look how things have changed" throughout the issue, via discussions of Professor Xavier's recent methods and actions post-"X-Cutioner's Song": his mind-wiping of the crowd in France, Archangel's acknowledgement of how Bishop's presence has contributed to his more proactive approach, and the reveal of a shared past with one of the new Acolytes. Issue #200 was all about setting up Magneto to be the new Xavier. This issue flips that, and asks the question: how much of Magneto is in the new Xavier? It's a question that will run through much of the thirtieth anniversary celebration of the X-Men, and beyond (along with the Legacy Virus plotline, also kicked into high gear here, which will impact the series significantly, soon, then linger...quite a bit longer). And thus, just as with issue #200, which put the series on a path it followed, at least in part, for seventy-five issues, issue #300 is as much about pointing the way forward as it is celebrating what's come before, making it a pivot point between the past and the future. All of which seems more than enough to justify the fancy cover and to qualify this issue as the "BIG DEAL" my younger self failed to see it as. Tomorrow, things get sick in X-Factor #90. Friday. Wolverine goes to the Savage Land in Wolverine #69. Next week, Cable returns in Cable #1. I'm a big fan of JRJR, and I was especially glad he returned to X-Men. This issue is of particular significance for me because it was around this time I stopped caring about the X-Men. Everyone has "beginning" and "ending" moments of reading comics. This was my ending. For me, X-Men will always be Cyclops, Storm, Colossus, Nightcrawler and Wolverine. 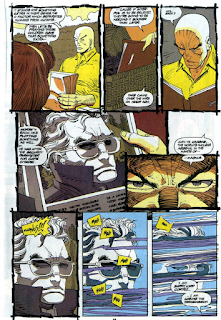 Today, aged 32, with no connection to present-day comics (and all I hear is that they are awful), I can say that the X-Men had a role in the formation of the person I am. 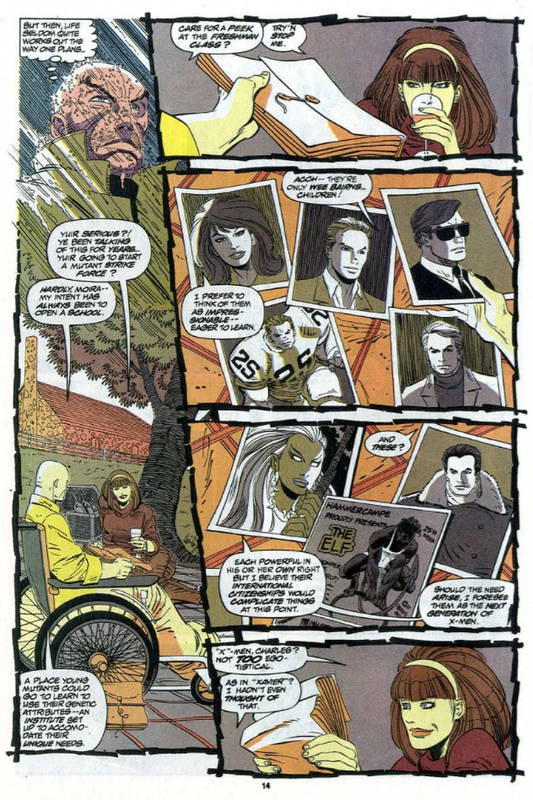 They were (and here I'm talking about Byrne/Cockrum/Smith X-Men) fundamentally good people trying to do good and not getting much in return, but who counted on each other as one family. I felt part of that family. It broke my heart when Cyclops dumped Maddy (who was a nice person) and seeing how nasty the X-Men became after Mutant Massacre turned me away, but I kept reading it out of loyalty. This is why X-Men #1 by Jim Lee was so important for me. Seeing them all together again (well, except for the much missed Nightcrawler and Shadow Cat) felt just right. That stories became overly complicated, with too many mysteries and too much focus on Wolverine again turned me away. This time for good. I appreciate your reviews. I was glad to remember my childhood and my old mutant friends. Funny, this was pretty much my "end" as well. I'd dropped the title a few issues prior, but was prompted to pick this one up with the anniversary issue number and foil cover--I'm not even sure I was aware it was JR Jr.'s return issue. I would pick up the next gimmick cover, #304, and then wouldn't touch them again for years. Two bits of nostalgia in one day! It's funny, the X-Men have been such a big part of my life, but I don't remember how and when I actually discovered them. It was more than likely through the cartoon (I was 6 when it debuted), and I know I had a copy of X-Men Classic #54 my dad gave me. But I'm pretty sure this was one of the first issues of the book, if not the absolute first, I bought the month it came out. I haven't picked up this issue in easily 20 years, but I still remember so many of these panels vividly. And believe it or not, because I saw the word "Neophyte" here for the first time I always assumed it was in reference to a superpowered being or an alien/monster race or something (It sounded like that to me). I believed this until my mid-20s when I found out what neophyte actually meant! And from here on is *MY* X-Men. This is the team and the adventures I picked up every month with my allowance money. It's funny, time went by so slowly as a kid that I assumed JR Jr.'s second run lasted for years. Turns out it was only a handful of issues before Joe Mad took over. Yeah, I remember reading this stuff in real time, it felt like everything took FOREVER. 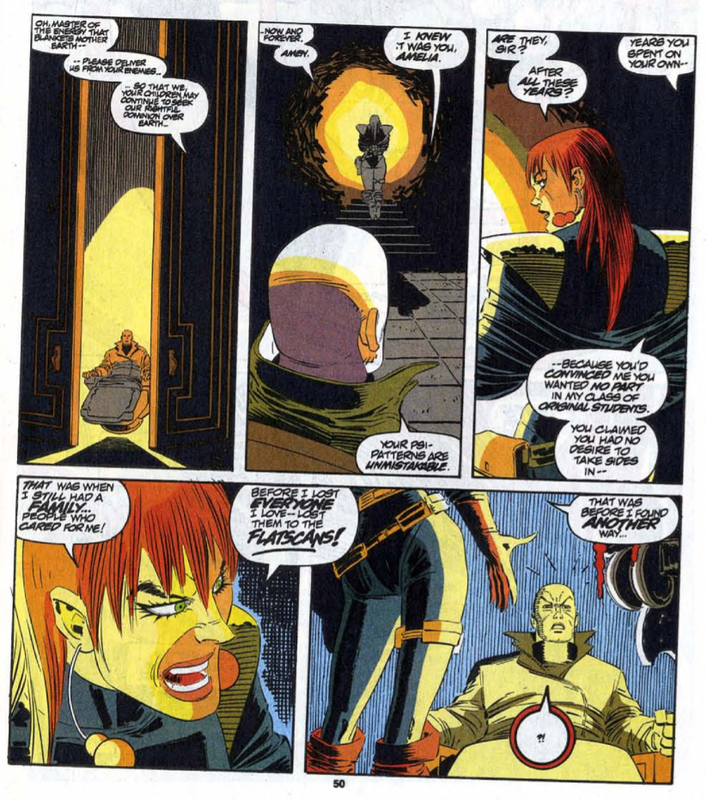 Like Magneto had been dead for EONS (it was really just about 18 months), that JRjr's run was lengthy, that Illyana had been sick forever when it was really for just a handful of issues. Just a combination of reading the issues a month-at-a-time, and the relativity of time. "We also see that Xavier was aware of the "All New" X-Men prior to the creation of the team, but chose to go with the original five as they were younger and thus less set in their ways." I always assumed the All-new team was younger than the original 5, if not the same age. Colossus should be an adolescent in that photo, given that he was the youngest of that team. I guess that was a slip-up, given that the original 5 never interacted with the All-new team until they were young adults. Colossus should be younger, but Storm, as well as Banshee and Wolverine (of course) are considered older than the original five. Nightcrawler is probably roughly their same age - he turned 21 in Annual #4 (of course, specific years/ages are always dicey with Marvel's Sliding Timeline, but the general idea of Colossus being the youngest of the new X-Men with Storm, Banshee and Wolverine all older than the original five is pretty consistent). Well Storm's age is a bit weird- the first telling of her origin made her 5 at the time of the 1956 Suez War, so she'd be 25 in 1976, but the writers keep moving the war around so her age changes. (And at this point we've run into the problem that Egypt's been at peace with it's neighbors since 1979, so Storm would have to be over 40.) I assume Storm is roughly the same age as Jean and Scott. Banshee and Wolverine are much older- Wolverine of course and Banshee because he has a daughter that's at least in her late teens. "Scanner (who can detect other mutants)"
This might not be Scanner's first appearance- an Acolyte called SCREENER appears in Avengers 357- that might be meant to be Scanner. Yeah, I see that Wikipedia splits the difference and lists both AVENGERS #357 and this as her first appearance. I confess even though I had washed my hands of the X-Men titles by this point, the shiny cover and JRJr. drawing the return of Nightcrawler were enough to make me pick this one up. I liked that it was so self-contained and enjoyable on its own terms (good for me, since I hadn't read the four issues before it, and wasn't planning to read any after). I probably only read the issue once, maybe twice, so I barely remember it. 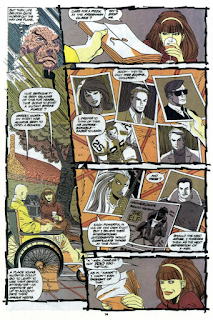 But it does hold a place in my heart, as my "last" X-Men comic for about six years (and those were high-school/college years, so six felt like 20 ...). This issue always seemed like the best work JRjr did on this run on UXM. I don't know if it was ever as good again. I agree with you a that at the time this seemed a little underwhelming for an issue 300 and in a way it still does, but it's a good issue. It's mostly self-contained and has a lot of good character beats. You can't ask for much more than that from this era. Xavier in love with a redhead student, well I never! I don't know; the issue's always been somehow off for me. The comparison to #200 doesn't help at all me here, but underlines the differences in the eras to this one's detriment. Funny though that the villains of #200 were Upstarts. Not the bookend Claremont probably was looking for. The nice French girl went the way of Nicholas Damiano. That's just wrong. But maybe there is thematic continuum #161-#200-#300. Teemu -- "The comparison to #200 doesn't help at all me here, but underlines the differences in the eras to this one's detriment." Funny; I like this issue so much more than #200, they can't even compare. This feels like an X-Men comic to me; the other feels like a story about a bunch of imposters. I obviously carry the bias of the first third of #200 being published in my very first X-book issue and all the references to everything around Marvel Universe that you don't know anything about and are intriqued as hell. But, the beauty of the Claremontian UNCANNY was the continuous zip-zapping between various members of the very large cast, and the "meanwhiles" that hint of stuff happening three issues forward. Here are no cast members who are not connected to the immediate story. That's not how you do UNCANNY. Plus, the prominence of female characters was just out of the world and it was in great show in #200. That I feel was magnificently ruined in the re-"boot" where the original X-Men assumed their old marguee roles and the men of All-New were pushed to the forefront to the detriment of woman characters. The X-Men of UNCANNY #200 onwards was very much a female team, and Claremont totally sold it to a pre-teen boy which is a feat, and it was great, and then it was gone and I can't unmarry this issue in my mind from that premise. And I liked the pre-Berlin Wall breaking zeitgeist being on the show. And the villains. Fenris, what ever one thinks of them, at least have certain legitimate Marvel pedigree as the kids of the Silver Age villain Wolfgang von S (admittedly a recent addition to the X-Men mythos, but with a good Marvel rep). Acolutes on the whole are an epitome of horrible unhistoric* 90's foe group with "a what?" codenames and "okay them..." powers, and the one with supposed history with Xavier is quite an egregious retcon implant from the get-go. Back in the day in #193 the Hellions were great "something old, something new" antagonists for the 100th issue of the All-New, All-Different; now this is what they try sell me right in the heels of the recent and very pointed Hellion slaughterfest. In Star Wars comparison, it's like I hadn't seen the Episode IV, but liked tremendously of The Empire Stikes Back, and now fifteen-twenty minutes in The Return of Jedi I learn they are going to heavy-handedly ignore if not downright retcon away the Episode V. Well, maybe Star Wars is a bad comparison, but it's pretty much like they were to now make a third Snake Plissken film, that retcons away most of the beautifully slightly over the top Escape From L.A, because they got the *tone turns to underline mockery* "creative vision" that they want to re-do more of a modern day adaptation of Escape From New York, and I'm sitting here with my Deluxe DVD package "Map To The Stars" and slight crush on A.J. Langer asking: "Dafuq you think you're doing?" I will take the Acolytes, in all their 90s-ness, over Day-Glo 80s Fenris any day of the week and twice on Sundays. "Followers of Magneto fight students of Xavier's" just has so much more thematic resonance than "Kids of otherwise unrelated Marvel bad guy who fought Xavier in one flashback issue fight the students of Xavier". Well actually Magneto was the actual villain in #200, but a multifaceted one and, obviously, facing a trial for his villainous acts. The Fenris twins were more of one dimensional bad guys merely juxtaposed with that. And Sir James Jaspers in his way yet another. Cackling Fabian Cortez leaves something to be wished for compared to that. And obviously Xavier and Gabrielle Haller joining to defend Magneto on the eve of Magneto assuming the mantle of the principal of Xavier's school beautifully bookends the developments that had started back in the day with the events depicted in #161. Despite the thematic resonance #300 is essentially the X-Men going to some guys' lair to hand them their asses. Oh, and. An off-putting element to me in this set of "followers of Magneto" is that they're specifically worshippers of Magneto. Though, the religious following can of course be seen as a new angle to an old thing that was the preceding polito-ideological approach of the both iterations of the Brotherhood of Evil Mutants, and the pragmatism-inspired "selling out" by Mystique in #199 and the "Freedom Force" then becoming the Judas that sells Magneto to the authorities. 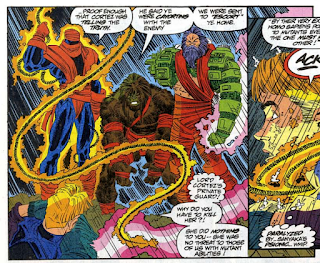 The context for "the Acolytes'" emergence possibly is their condemnation of the previous generation which allowed themselves to be waylaid by logical argument from their non-religious commitment to the Magnetoan ideology of mutant supremacy. But, the early 90's also saw the other great 80's thing the Hobgoblin too to take a turn to religious extremism, and the thing with religious extremism is that you're not bound to sensibly cut your losses and bail out in middle of a battle that's taken bad turnvfor you, so the heroes only have the boring (story-telling) out of beating the foes into submission. It's also gone back to very Silver Age black and white all of the sudden, compared to the #200 era status quo of X-Men the mutant outlaws vs. the government-sponsored former Evil Mutants. I don't know what to make of the the fact that in the Acolute point-of-view Magnus probably pretty much was tempted by Satan-Xavier in the desert, died, got resurrected, and is soon to step up to his personal heaven in the geo-syncronic orbit to where he delivers his people and has an angel dude going around as his harbinger. Idk, it's not the greatest story ever told. I don't know what to make of the the fact that in the Acolute point-of-view Magnus probably pretty much was tempted by Satan-Xavier in the desert, died, got resurrected, and is soon to step up to his personal heaven in the geo-syncronic orbit to where he delivers his people and has an angel dude going around as his harbinger. Wow. That's a pretty fantastic reading of the Acolytes' perspective on Magneto that I've never really considered before. Seriously, I love that. It's actually difficult, if you adopt that reading, to not think UNCANNY #150 and the sinking of nuclear submarine Leningrad and the Varykino volcano as the throwing the moneylenders out of the temple (of Chtulhu on the Caribbean island, as it may be) incident that gives the pretext for the subsequent trial in #200 where it's more the ideology that the act that's on trial. It's also very difficult to not find appreciation to the fact that in X-MEN #3 it's a Soviet "nuclear plasma cannon" and the missiles raised from the submarine that serve as the fitting means of Magneto's death. It's almost said in the text that USA washes its hands from the happenings as Soviet Union acts. Actually #300 starring Magneto's disciples suddenly sees very appropriate. Also, if the editorial had these similar parallels coming up around these times, the retcon of Erik Lensherr the Sinte gipsy starts to look like a panicky move to insist that Magneto is not Jewish... like that other guy was. The re-retcon of Magneto's real name to the very Jewish and near-ridiculous "Max Steelhard" suddenly also seems very pointed meta to the Erik angle. Funny coincidence that his two on-panel loves are named Magda and Lee. Yeah, with so much happening in issue #304, and then X-MEN #25, and then WOLVERINE #75, this one kind of gets overshadowed in the celebratory hubbub. I really like this issue, though it was my final UNCANNY for over a year (aside from the "Fatal Attractions" installment) since I was not a fan of JR jr. As a kid I didn't read EXCALIBUR, so for many years I thought this was the first time Nightcrawler had seen the X-Men since "Mutant Massacre" (though it turns out I wasn't really that far off). I love the characterizations, the fight in the monastary (particularly Bishop dropping through the ceiling), the battered Magneto helmet the Acolytes worship, and that final page super obvius hint that Magneto is still alive. And, as JR jr.'s art has grown on me considerable, I believe no one can draw rain quite as well as he does. In all, this is easily one of my favorite issues from the Lobdell run. Thank you for pointing that out! It's always driven me nuts that this kid's codename is Neophyte. That'd be like the X-Men codnaming Kitty "Rookie" instead of Sprite or Ariel. "...reuniting the core of the "All New, All Different" team..."
Maybe, but I really wish Lobdell had found a way to work Banshee into this story too. He's just as integral to that group in my opinion. "I believe no one can draw rain quite as well as he does." Good one. I think I might agree. Acolytes are not the loving family that is the X-Men, but an extreme ideologist terrorist group bent on pushing any kid happening to hover into their fatal attraction further away from the normal notions of the society. Destroying any individuality of his own it right up that alley. And obviously, Fabian Cortez is a jerk. I too wish Banshee had made an appearance. Especially since Claremont managed to work the retired version into #193's anniversary celebration. 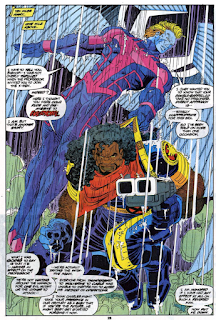 And thirded on the power of John Romita Jr.'s rain. I have been reading these reviews for about a year now and have been waiting for this one in particular. 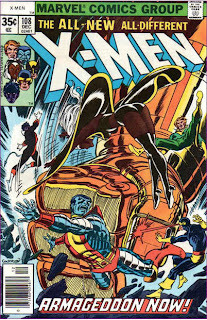 This issue was not the first X-Men comic I read (I think that was X-Men #1, which my brother bought), nor the first one I bought (I remember buying two non-continuous chapters of the X-Cutioner's Song storyline). 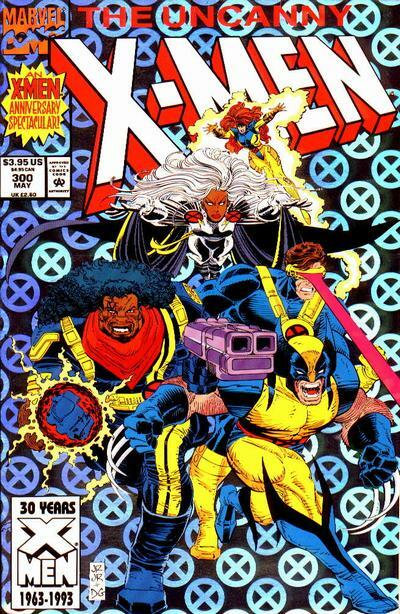 However, Uncanny X-Men #300 was the first issue I bought in my first run of X-Men comics. I went on to buy more or less every issue of UXM and X-Men for the next three years, taking a brief break leading up the Age of Apocalypse, before getting hooked back in around the time that storyline ended and staying with X-Men through Operation: Zero Tolerance. With a few scattered hiatuses, I've now been following X-Men comics for roughly 24 years, well over half of my 34-year-old life. With Marvel Unlimited, I've now also gone back and read pretty much everything from Uncanny X-Men #100 through to this issue. So, it is with a great deal of fondness that I remember this particular issue. I think I even remember at which local newsstand I bought it. Re: UXM 300. I thought the storyline was quite epic (even though I can see now that it wasn't). I LOVED Nightcrawler being a guest star. (I already knew something of the X-Men's back stories through Marvel Universe and X-Men trading cards.) At the time, I didn't think anything of JRjr's pencils, but they shaped how I thought the X-Men looked in my head for years. Also, even though there is a fair amount of continuity in this issue, I didn't feel lost or bogged down by it when I read it as a child. As others have written, I was intrigued by the hint that the story I had read was only one chapter in the larger epic of the adventures of the X-Men. So glad to see this one finally reviewed, and now I cannot wait for my personal favorite Lobdell issue (UXM #308, of course). 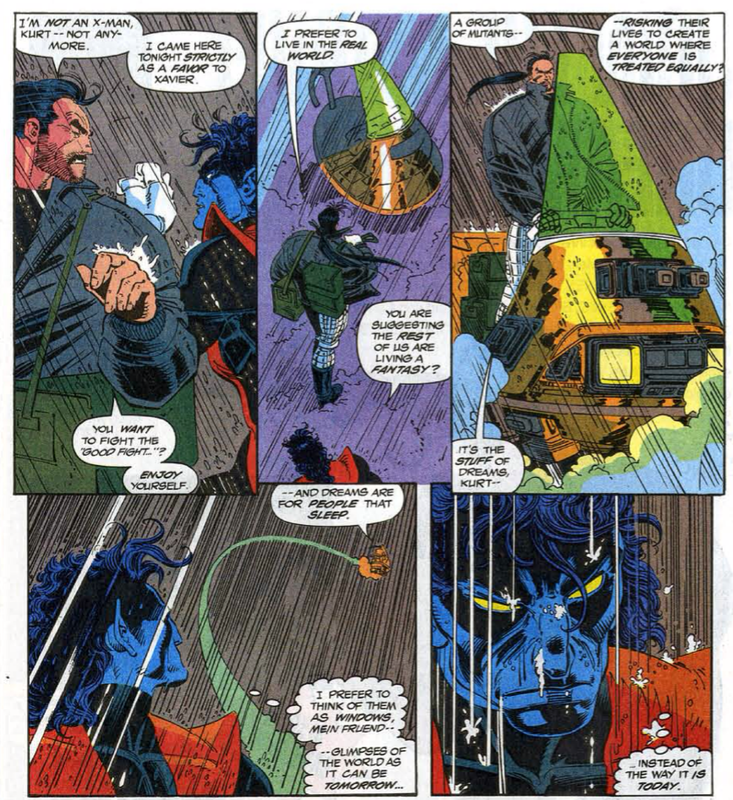 I found it weird that the captions strongly suggest Nightcrawler (a) bamfed himself to Forge’s location (b) merely from coordinates. He can’t teleport anywhere near the distance the north coast of France is from Excalibur’s lighthouse — either in a single hop or several in rapid succession — and he needs either line of sight or familiarity with a destination to get there without extreme risk. Unless I’ve forgotten some power boost that’s come along since he recovered from what a strain teleportation had become for him, which is possible. Xavier could’ve telepathically given him a visual of the location, sure, and he might’ve already been nearby for some reason, or he could’ve simply flown to the area in Excalibur’s jet before jumping the last bit of distance to Forge’s makeshift tech camp himself, but you have to actively read any of that into what’s presented. 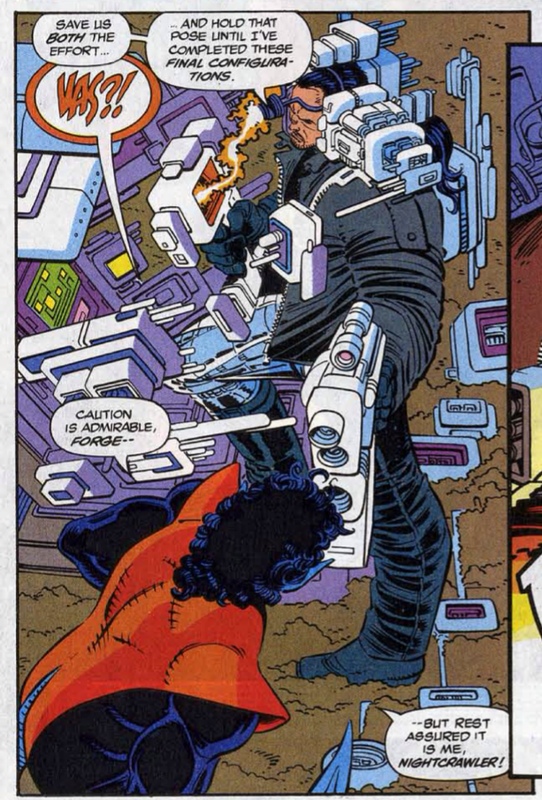 Stryfe is referred to in a caption on that page as a “timelust villain” (emphasis mine) rather than the presumably intended “timelost”. I really like some isolated bits here in particular and the angular three-dimensionality he’s developing in general, but still have my old JRJr./DG complaints on several fronts. Which brings me to the fact that it’s kind-of interesting how most of the Acolytes don’t seem to have or use codenames, but they still wear if perhaps not quite costumes then fairly individualized variations on a common outfit — more so than the Hellfire Club goons, or Starfleet personnel, or even the X-Men training uniform — that appear more (questionably) ornamental than utilitarian. Cortez’s personal guard, as you note, is an exception. Unless I’ve forgotten some power boost that’s come along since he recovered from what a strain teleportation had become for him, which is possible. Does anything come of his having left the X-Men to support Mystique (at least nominally, following his perceived rejection by and psychoanalysis of Storm)? I’ll get there eventually if it does, reading along, but it’s odd that here his reason for heading out again is a disagreement with Xavier’s and the team’s supposedly pollyanna ideology. Thank you again. I’m often afraid I’ve forgotten something when I have a reaction like that, so it’s nice to know it’s shared. Ha! You’d think they could bond over frustration with Xavier shot-calling when joining a mission. The page from which those panels are taken, by the way, shows Wolverine… um… flying. 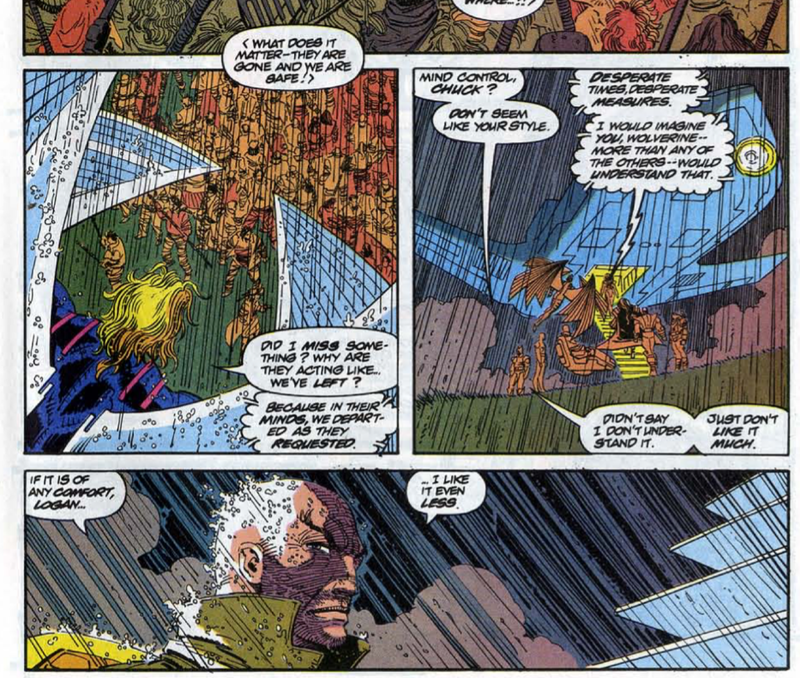 My conjecture is that the intention was for him to be riding a wave of wind generated by Storm, who’s right above him, but it sure looks strange and I was already tired from the inferential gymnastics required to get Nightcrawler to France safely at the start of the issue. Quite a number of minds to dupe at once — dozens, it seems to be. Also, I know he wasn’t all that visible in the rain at a distance — and he could presumably blur the locals’ mental impression of him, and they’d mostly remember little more than a bald dude in a hoverchair — but having Xavier out in the field (literally) with the X-Men is really a questionable move right on the heels of reminding us the general public isn’t supposed to know he’s a mutant. Does anything come of his having left the X-Men to support Mystique (at least nominally, following his perceived rejection by and psychoanalysis of Storm)? Kind of. Mystique will appear alongside Forge in the next issue, and eventually (post-"Age of Apocalypse") they'll both end up as members of X-Factor together, but there's never really a big "Forge & Mystique" story to suggest his leaving the team ostensibly to take care of Mystique was ever anything more than a deck-clearing exercise.